We develop games for many operating systems including Windows, Mac, Android and iOS. We use various software to code these programs. Some use Unity, some use Android Studio, and some create mobile games using HTML5. Unity allows for development of 3D games that can be ported to several platforms. We follow the CSP course, using with MIT App Inventor software to design mobile applications for Android. This is a great beginner course, as it is simple to learn, but teaches all of the necessary concepts that are fundamental to later work in the field. The App Inventor interface consists of drag and drop blocks of code that click together. Combined with the Mobile Computer Science Principles course, App Inventor educates students on all of the basics of programming, without going into the syntactical code needed to write such programs. After creating these mobile applications, students can run their application on an Android Tablet. This allows the full creation of a working application without knowledge of advanced syntax, which will be learned later on. 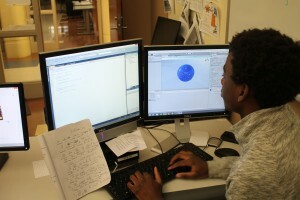 We utilize the AP Computer Science course on zyBooks to learn how to program in Java. The course is not just a textbook, but rather an interactive page, often with questions on the reading and even challenge activities where one must actually write Java on the page. In addition to going through the course on zyBooks, we often have labs. Labs are challenges where we create specific programs, usually relating to something we learned recently. We also have tests for the Advanced Placement examination at the end of the year. We also learn about Web Development. We write websites using Hyper-Text Markup Language and we style them using Cascading Style Sheets. We write the websites using NotePad ++ or Adobe Dreamweaver. We read chapters in the textbook and then do some assignments with mostly consist of either creating websites from scratch with descriptions in the book, or correcting pre-made sites from the book.